Ira Josephs from the Media Fair Trade Town Committee and Loic Barnieu, Media restaurateur extraordinaire, were lucky to attend this recent conference in the Fair Trade city of Madrid, Spain. It was super informative and inspiring to learn from Fairtraders from around the world. There were folks from Spain, Central and South America, England, France, Belgium, Germany, Sweden, Wales and more! We learned there are more than 2000 FT Towns worldwide and a benefit of $204 million for 1.6 million FT farmers through the $9.74 billion in sales in 2017. Seems like a lot, but it is really only a drop in the bucket. A common theme we kept hearing was that Fair Trade is intimately linked to environmental issues and climate change. Everyone agreed we need to make Fair Trade the norm! There were some high level activities going on among some big players there. Sergei Corbolan, the Executive Director of the Fair Trade Advocacy Office (FTAO) based in Brussels, gave several presentations and sat on some panels. His job is to advocate for Fair Trade to the European Parliament, the European Commission and the UN. Another participant was Isabelle Durant, the Deputy Secretary General of the UN Conference on Trade and Development (UNCTAD). They signed a Memorandum of Understanding to work together to make trade fair for everyone! Also, Media, PA’s own FT Town mascot, Fairis A Frog, reappeared after being MIA for several years. Not only has he traveled to Costa Rica to visit FT farmers, he attended the International FT Towns Conference 3 years ago in Bristol UK, and went from there to the FT Town of Saarbrucken, Germany. 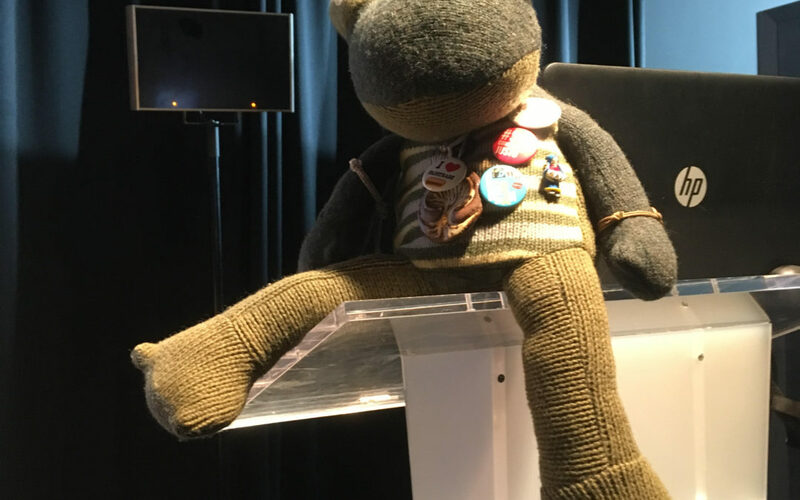 He spent a year in the FT office of Sweden, or was that Switzerland (hard to keep up with this globetrotting frog!). And now he is off to reside in Wales until next year’s conference when he will be handed off to the next conference host city. Safe travels, Fairis!